Nahariya-area factory works with Environmental Protection Ministry to remove asbestos from beach; Ministry stresses cleanup still underway. The Environmental Protection Ministry recently allowed visitors to the western portion of Nahariya's beach after a six-year cleanup of asbestos contamination. Other parts of the beach are still being cleaned. 150,000 cubic meters of soil polluted by asbestos were removed from the area, and 40,000 cubic meters were removed from the beach, at a total cost of 407 million NIS. Asbestos was also found on rocks, which have been covered for visitors' safety but not yet treated. The asbestos pollution was caused by Eitanit, a former asbestos cement factory in near Nahariya which operated from 1952-1997. The beach was regularly doused with asbestos during the 1980s. The factory's owners split the costs of the clean-up with the Environmental Protection Ministry. Environmental Protection Minister Ze'ev Elkin (Likud) said, "Following a complex and professional clean-up conducted by the Environmental Protection Ministry, the northern coast has been returned to the public. This is after the removal of a health and environmental hazard." 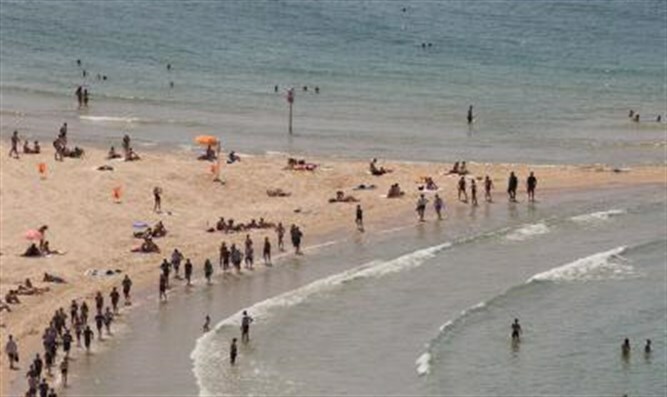 "A significant part of the project was completed before the [Pesach (Passover)] holiday, allowing the public to enjoy the beach during this holiday, as well as the spring and summer months. "We are currently examining, together with the municipality and other entities, how we can continue the project for the benefit of the public and the area."